Are you feeling unbalanced and unhappy? Do you get irritated quickly, or are you just searching for something good to do for your health? 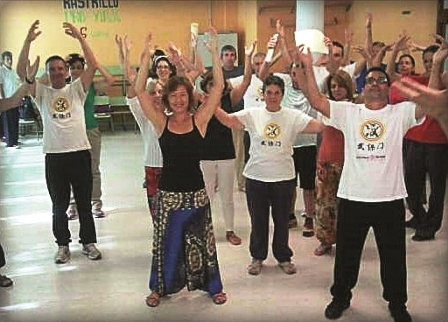 QiGong could be just what you are looking for. 11.11.2014 - Literally translated, QiGong (pronounced Chee gung) means ‘working with the life energy’ and was developed more than 2000 years ago in ancient China. It involves the cultivation, strengthening and refining of our own healing powers. Energy is activated by the movement and breathing exercises, invoking a deep relaxation and allowing the mind to empty. When our self-healing forces are enabled we can achieve a greater balance; stress levels are reduced and mental and physical health is improved. There are many different styles of Qigong but I personally practice Wubaomen QiGong. Sun Junqing, from China, has lived in Europe since 1991 and has brought this technique, which he learnt off his father Sun Yun-hai, to the West. Wubaomen QiGong has the advantage of consisting of very simple exercises, with some that can even be practiced whilst sitting. The gentle movements help clear energy blockages and can aid the healing of various diseases, including of the inner organs; thus QiGong is an ideal way to do something positive for ourselves and our health. I offer QiGong classes in the Ecozenter in Chayofa, as well as the Cristoforo centre in Playa Paraiso. I would also be happy to form groups in other areas of the south. Elena Herz is a fully qualified physiotherapist and alternative therapist based in Chayofa, South Tenerife, and La Laguna in the north. She can also make home visits. Call: 600424252, email: e.herz@gmx.net or see: www.about.me/elena.herz for more information. Produced with news.CMS in 0,0747 seconds.